Excerpts from "The Self-Made Myth"
Today we find ourselves facing the lingering effects of the Great Recession. Unemployment is still near double-digit levels. Homes are still being foreclosed upon in record numbers. Banks are still not lending. Despite the enormous challenges we face, our nation seems unable or unwilling to come together and solve the serious problems before us. Instead we are caught in an intractable battle between two opposing views for solving the economic crisis we are in, each arguing that their policy solution is more fair, morally justified, and, in the end, more effective. We believe that a large part of why we have such differing views in the realm of economic policy is because we have such divergent views on where individual success and wealth come from. In this book we explore a deeply held belief in our society— the myth of the “self-made man,” or what we are calling the self- made myth—and we offer an alternative that we believe is more honest and complete: the built-together reality. These conflicting paradigms are summarized in the table on the following pages (see “At a Glance: The Myth vs. the Reality”). It is our hope that by coming to a deeper understanding of the origins of individual wealth and success, we can begin to achieve greater agreement on solutions to the economic crisis we are in and point the way toward a new era of broadly shared prosperity. The self-made myth is the assertion that individual and business success is the result of the personal characteristics of exceptional individuals, such as hard work, creativity, and sacrifice, with little or no outside assistance. Those who subscribe to this myth do so only by ignoring the contributions of society, the supports made possible through governmental action, any head start a person may have received, and just plain old luck. 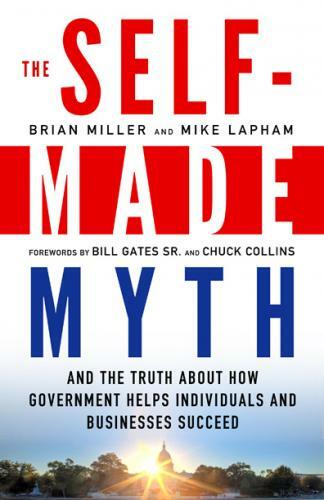 If this were purely a matter of ego and self-delusion, it would not warrant such a book, but the perpetuation of the self-made myth has profound and destructive impacts on our views of government and the public policy debates of our times. In writing this book, we do not discount the fact that a person, through hard work, creativity, and short-term sacrifice, can better his or her position in life. In most cases one can. To assert that success is entirely the result of such individual character traits, with little or no help from others or society, however, has a corrupting impact on our policy debates. How we view the creation of wealth and individual success has a profound influence on our choices of policies to embrace. It shapes our views on taxes, regulations, public investments in schools and vital infrastructure, the legitimacy of extravagant CEO pay, and more. We believe the time has come to re-examine how businesses succeed and individual wealth is created. In doing so we develop a more complete picture, one that includes the important role of hard work but also takes into account the role of others and the many roles of government in laying the foundation for business success. We call this more rounded and honest understanding the built-together reality of individual and business success. In short, the built-together reality asserts that individual and business success is built through hard work but also taxpayer-supported schools, roads, and courts; the contributions of others; and chance factors like luck, historical timing, and various head starts in life. [T]his book draws primarily from the first-person real-life stories of entrepreneurs, business leaders, and other high- wealth individuals, using their own words. Through their stories, and a few facts we included for good measure, we seek to establish a more balanced understanding of the true sources of individual wealth and business success. Their stories paint a much different picture than the self-made myth. In addition to the importance of hard work, creativity, and short-term sacrifice to their business success, they talk of the contributions of co-founders, colleagues, and employees; the role public investments play in wealth building; the role of government rules and regulations that provide a stable framework for business to operate and thrive; and additional factors such as inheritance, privilege, and luck. This is the essence of the built-together reality. By acknowledging the various factors contributing to wealth creation, the built-together reality lays the foundation for a more honest debate about the issues of our time. The built-together reality acknowledges the way public investments in our shared prosperity lift us all, including entrepreneurs and business leaders. By this view government plays an important role in building a foundation upon which individual and business success is possible, by investing in schools, transportation, and more; by sowing the seeds of innovation; and by ensuring stable rules of the road. With the built-together reality and the public investment imperative that flows from it in clear view, our views on a host of issues and policy choices shift in dramatic ways. Jerry Fiddler was co-founder, CEO, and chairman of Wind River Systems in Alameda, California. Now a mentor, an investor, and a professor of entrepreneurship, he helps entrepreneurs start new businesses. “One of the things people don’t talk about is how much we really rely on government institutions to maintain a fair playing field. Entrepreneurship is an equalizer, a way that people who aren’t wealthy can become more wealthy, can become more independent, and in the process can provide a huge amount of benefit to society as a whole. But we live in a society right now that is going in exactly the opposite direction. The disparity in wealth between the bottom and the top is growing dramatically, and the middle class is being squeezed out. All of us, but especially entrepreneurs, rely on the government’s role of creating a level playing field, and people like the SEC and the FTC [Federal Trade Commission] and other regulating agencies are critical to entrepreneurship. Large business interests obviously put huge effort into lobbying, much of it into reducing regulation, but for small businesses, for startups, that regulation is important. The only way that you can have a healthy startup economy is if you have a level playing field that allows those companies to come into being and to compete, and that has to come back to some level of regulation; the government has to be regulating. And then there’s the rest of the infrastructure that we need—the roads and the railroads, transportation and information infra- structure that makes wealth creation possible in this country. Thelma Kidd is the co-founder of Davis-Kidd Booksellers, which grew to four stores across Tennessee, employing more than 200 people before being sold to another independent bookseller in 1997. “Women have started, owned and inherited businesses in the United States since the founding of the country, yet official recognition and support for women’s enterprise development has been in existence only for the past 25 years . . . The first federal government program to assist women’s business enterprises came as the direct result of lobbying from women business owners. Due to their efforts not only in lobbying the federal government but in urging the appointment of women in key agency positions, an interagency government task force was created, and a research study was conducted to review the status of women-owned firms in the US. The resulting report, “The Bottom Line: Unequal Enterprise in America,” documented some of the barriers that women faced in starting and growing their businesses. In response to the report, President Jimmy Carter issued an executive order in 1979 establishing an Office of Women’s Business Ownership within the US Small Business Administration. Glynn Lloyd is the founder of City Fresh Foods, a Boston- based food service and delivery company. “Well, let’s talk about transportation. We’re a delivery company. We’re going 60 to 70 miles north, east, and south. So without roads, we have no business. We’re using back roads, side roads, and highways. Interesting enough, this was a tough year for us because we do a lot of the schools. Due to the heavy snow, we lost five days of school this year in terms of business, which is unheard of in the past few years. But there would have been a lot more if we didn’t have the infrastructure to clean the streets [and] put the salt down, which I know is very expensive, actually.